Rack enclosure, an effective solution to a tidy rack cable environment, has been a popular choice for IT technicians. Conventionally, being a kind of cable organizer, the rack mount enclosure is widely used in data centers to house, organize, manage and protect fiber optic cables. With such great significance, it’s necessary for us to explore this device. In the beginning, let’s drive from physical features of the rack mount enclosure, including rack units, accessible types, and loaded items. Specifically, the rack enclosure is designed into a 19-inch rack mount. When it comes to application, the rack units of this fiber optic enclosure are available in 1U, 2U, 3U, and 4U in the market. Usually, users may prefer to choose two or more 1U rack mount enclosures instead of buying one rack mount enclosure 2U, 3U or 4U type. For 1U and 2U rack mount enclosures, they are accessible both from front and rear with a drawer sliding forwardly or backwardly; while 3U and 4U rack mount enclosures are featured with a fixed bulkhead design. Since the rack mount enclosure 1U version is commonly used in organizing server rack, we take 1U rack mount for a case to study this feature. Altogether, there are three types of rack enclosures: cover removable, slide-out, and swing-out fiber enclosures. Compared with a cover removable type, the slide-out and swing-out fiber enclosures are more favored. Neglecting the fact that the cover removable type is the cheapest one among these three types, the slide-out and swing-out types are more convenient for their pull-out sliding trays. In that way, users don’t have to remove the whole fiber enclosure from the rack to gain internal access. Catering to different requirements for cabling, different accessories are loaded with rack mount enclosures: fiber adapter panels (FAPs) and MPO/MTP cassettes. A rack enclosure with FAPs can be applied in both pre-terminated and field-terminated cabling environments. Generally, adapter patch panels are available to connect with LC, SC and MPO/MTP fiber cables. According to adapter numbers on FAPs, rack mount enclosures can support up to 96 fibers. 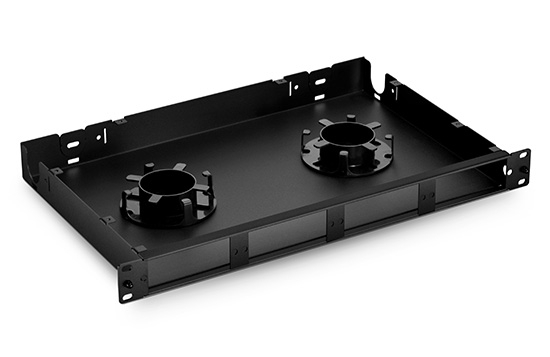 In most cases, a 1U rack mount enclosure can support up to 4 FAPs, while a 4U rack mount enclosure can support up to 12 FAPs. Besides FAPs, rack enclosures can also be loaded with MPO/MTP cassettes, providing secure transitions between MPO/MTP and LC or SC connectors. As a pre-terminated rack mount patch panel, this rack enclosure is designed to achieve interconnections between MTP/MPO backbone and LC/SC patching. When in a 1U rack space, rack mount enclosures loaded with MPO/MTP cassettes can support up to 144 fibers , such as the FS FHX 1U rack mount enclosure of ultra-high density. Through the above basic introduction of the rack enclosure, we can find it can never be an easy task to select a suitable rack enclosure. There are many factors you need to consider, such as rack units, accessible types, and loaded items. Still, there are other factors needed to be taken into considerations, such as the number of ports you need. And when it comes to the patch panel, you have to figure out whether the fixed or removable front panels are needed. Besides, you still need to think about the way to do fiber termination: splicing or pre-terminated. Last, but not the least, your budget for this purchasing. Obviously, all these factors, mentioned or not in this article, can have an impact on configurations or combinations of rack enclosures, contributing to your final decision. By the way, if you are looking for the detailed guidance of a 1U rack enclosure, you can refer to the article FS 1U Rack Enclosure Types and Selection Guide. This entry was posted in Racks & Enclosures and tagged cable organizer, rack mount enclosure, rack mount enclosure 1u on September 12, 2018 by Camilla.Zhang.